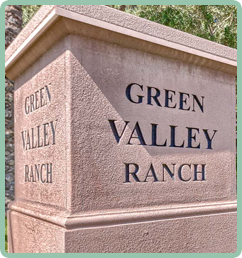 Each GVRCA homeowner is given a set of Declarations and Association documents when they purchase a home in The Ranch. Contained within these documents is the Declarations of Covenants, Conditions and Restrictions (CC&Rs) for the GVRCA. Each homeowner is responsible for following all the rules set forth in the CC&Rs. In the purest sense, a community association is a form of representative democracy. Everyone involved with the Association has a responsible role. The owners are expected to pay assessments, know their documents and participate at meetings and vote. The Board of Directors sets policy and administers the operation of the Association. GVRCA contracts with a management company to carry out the day to day operations, but the ultimate responsibility and decision for how the Association will run lies solely in the hands of the Board of Directors. The “prime directive” of the Association is to protect, maintain and enhance the value of the asset. This may involve hiring staff or contractors, setting policy, establishing rules, holding meetings and/or recruiting volunteers, but the basic “mantra” of all association boards should be to “protect, maintain and enhance,” for the benefit of ALL the owners.